We had nachos for dinner the other night, and I think this may become a regular in the meal rotation. It was so easy to throw together, and everyone loved it. Usually my kids aren’t that jazzed about guacamole or refried beans, but on nachos? Yes, gimme seconds, please! You can make it how you like. I used breaded chicken breast tenderloins. But really, any meat will do – carnitas, seasoned ground beef, etc. 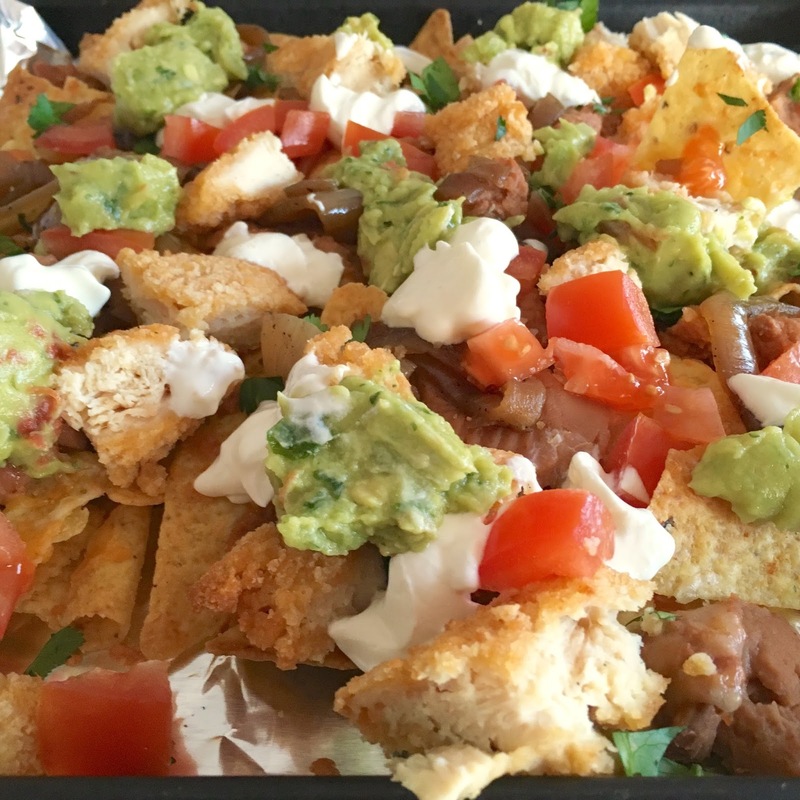 This makes a large tray of nachos that is great for family dinner or a party. Personal recommendation: have this with a cold beer. Set oven rack about 6 inches from the heat source, and preheat the broiler. Line a baking sheet with aluminum foil. Spread tortilla chips on prepared baking sheet. Top with cheddar cheese, refried beans, and chicken. Broil in the oven until cheese is melted, watching carefully to prevent burning, for about 3-5 minutes. Remove pan from oven. Top nachos with tomatoes, onions, sour cream, guacamole, and chopped cilantro or green onions. Serve immediately.